I believe I may have spotted the next big trend in the classic car world: At the spring exhibitions at Techno Classica and Retro Classics was an unusual high amount of camper vans – get one while you can! 1983 Westfalia T3: Two owners, 63,000 kilometers, outstanding condition, a great colour – and 48.000 Euro. But there were others. Lots, in fact – to the degree that I think we’re onto a trend here. Of course there has always been camper vans around – in their time as well as today, where many of them have grown into classics in their own right. But I do not recall seeing them out in such force at the previous editions of these two large German exhibitions – nor in the open marketplace for that matter. Which is why I believe we’re experiencing the establishment of a new niche. Interestingly, the camper-van-thing bucks previous trends in that they don’t score high on prestige, performance nor provenance. Provenance? Well, yes – you may have noticed that not many rock stars, actors, royality or tyrants were big into camping? That makes it highly unlikely that you’ll ever find a camper van with Rod Stewart as first owner, nor one the Shah of Iran used when hunting. If you do, I’d cry out for the greatest caution. Performance is maybe even the wrong word here: As most are loaded with equipment, they’ll often struggle at even the slightest inclination. Prestige? Well, no: Carrying a chemical toilet and a barbeque (be careful here) is quite possible the exact opposite of prestige. But even though camper vans don’t score highly on those first three P’s, they more than make up for it on the fourth: Practicality. No other classic car can possibly pose as a proper home for prolonged periods of time, while at the same time offering the usual option of ordinary road travel – even with lots of space for luggage, various equipment and even friends and/or family. How all that space is utilised in an early VW camper. I can easily see how that could be tempting. Especially as that practicality is not the charmless modern type found in any large SUV – it often involves both wood, forgotten colours and fabrics from a bygone era. All of which are of course the pure embodiment of: Charm, of course. And in fact, sometimes even the characteristic that I so treasure in a classic: Rarity. And herein lies a paradox: When something rare becomes popular the price will go up – it’s the old supply & demand-rule, quite simply. It’s completely natural and there’s nothing wrong with that. But when you touch on 50.000 Euro for a Volkswagen T3, I myself would have to think twice. Even if we establish that the price is fair due to rarity, condition and so on, the alternative classic cars of the more typical ilk are numerous in that price range. You could, for example, buy three Datsun Z’s instead and take six people on a road trip. OK, you’d still struggle with the chemical toilet and the barbeque, but I am sure you get my point. So I’ll conclude that this trend is not for everyone – but apparently, judging from the recent German exhibitions, there is real interest from quite a few enthusiasts out there. 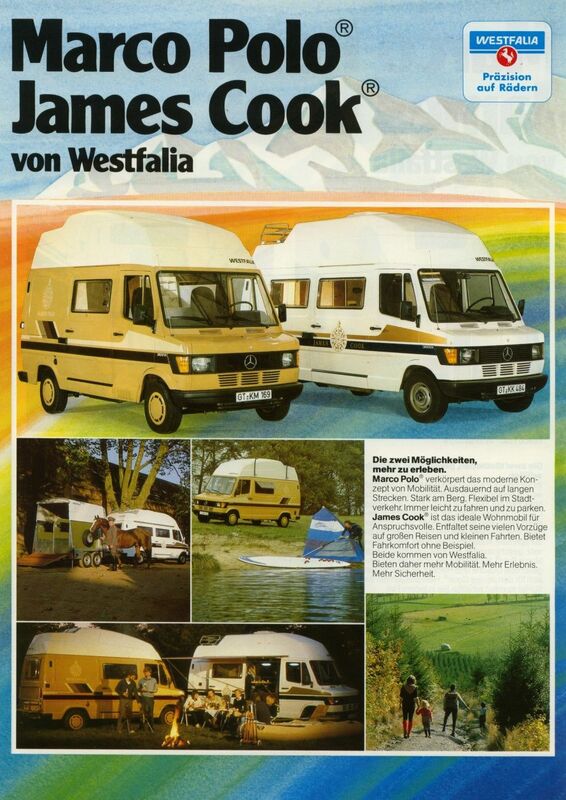 And many of the camper vans for sale were in extraordinary condition as well, and their low milage suggested they had not been used much either. I honestly doubt they would see much more use today as classics, of course – as is often the case for most classic cars, sadly. While I can easily see the charm in a classic camper van, I don’t think I am a proper candidate for actually buying one. Besides the fact that the prices themselves will see to that. Instead I would rather join the party when the tent has already been raised and the barbecue is fired up. I’ll then arrive in style and park my SLC along side the camper, thanks. Or two SLC’s, in fact – which being a full four-seater would even allow a company of eight to travel in comfort. Or – wait a minute – what if at least one of the SLC’s had a tow bar? OK, stop – I am getting ahead of myself now. But what do you think, dear readers – are we onto a trend here? Would you join it? HAVE you already joined in? And not least: Are their alternatives to the ubiquitous Volkswagen camper vans, preferably cheaper?
. I always liked that Mercedes, in fact. I love the names of those variants by the way: In Stuttgart I saw a T3 “Carthago”which is also a mighty name – but “James Cook” and “Marco Polo” takes some beating. Another alternative is the Peugeot J9.